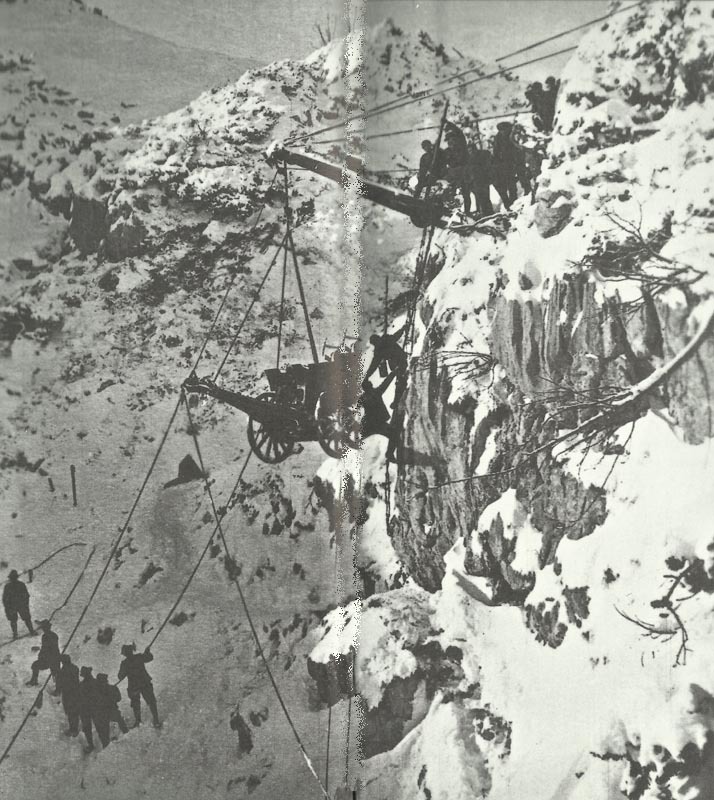 Italian artillerymen attempt to place a 3-in gun on the summit of a mountain in the Trentino. Trentino: Italians retake Asiago, Posina and Arslero regained (June 27), as Austrians begin silent and orderly general retreat from salient (night June 25) to prepared line holding 2/3 of gains since May 15 (until June 26). Salonika: Sarrail told he may have to attack soon with French and Serbs alone. Verdun: French thwart attempted German advance west of Fort Thiaumont. French gains in Fumin-Chenois Woods. War Minister General Roques visits. Armenia: Turks after surprise crossing of Pontic Alps overwhelm 19th Turkistanski Regiment. By June 30 within 15 miles of coast road but held at ‘Serpent Rock Hill’. Arabia Revolt: British in Cairo intercepts Djemal radio message to Fakhri Pasha in Medina allowing £5,000 spending in English gold. Cyrenaica: Sayyid Idris meets Allied Mission for talks (­until September). Anglo-Italian Agreement not to sign separate deal with Senussi (June 31, France adheres March 1917). Britain: Admiralty post­ Battle of Jutland inquest with Jellicoe and Beatty agrees to improve armour protection. Western Front: Royal Flying Corps spots 154 targets (5 German batteries silenced), fights 16 air combats and shoots down 6 German kite­-balloons. Britain, Easter Rising: Casement treason trial opens, death sentence on June 29.